In patients with diabetic ketoacidosis, the first principals of resuscitation apply (ie, the ABCs [airway, breathing, circulation]). Outcomes are best when children are closely monitored and a changing status is promptly addressed. [39, 2] Give oxygen, although this has no effect on the respiratory drive of acidosis. Diagnose by clinical history, physical signs, and elevated blood glucose. Fluid, insulin, and electrolyte (potassium and, in select cases, bicarbonate) replacement is essential in the treatment of diabetic ketoacidosis. Early in the treatment of diabetic ketoacidosis, when blood glucose levels are very elevated, the child can continue to experience massive fluid losses and deteriorate. Strict measurement of fluid balance is essential for optimal treatment. Continuous subcutaneous insulin infusion therapy using an insulin pump should be stopped during the treatment of diabetic ketoacidosis. Children with severe acidosis (ie, pH < 7.1) or with altered consciousness should be admitted to a pediatric intensive care unit. In cases in which the occurrence of diabetic ketoacidosis signals a new diagnosis of diabetes, the process of education and support by the diabetes team should begin when the patient recovers. In cases in which diabetic ketoacidosis occurs in a child with established diabetes, explore the cause of the episode and take steps to prevent a recurrence. Following recovery from diabetic ketoacidosis, patients require subcutaneous insulin therapy. Organize outpatient care through the pediatric diabetes care team. Consult a neurosurgeon if cerebral edema is suspected. Once the child has recovered, he or she can resume a normal diet. The International Society for Pediatric and Adolescent Diabetes published guidelines for the management of diabetic ketoacidosis in children at http://www.ispad.org/FileCenter/10-Wolfsdorf_Ped_Diab_2007,8.28-43.pdf. Administer isotonic sodium chloride solution until blood glucose levels have fallen to 250-300 mg/dL (ie, 12-15 mmol/L), at which time glucose-containing fluids should be introduced (either 5% glucose with 0.9% saline or 5% glucose with 0.45% saline); continue maintenance with dextrose saline until the child is eating and drinking normally. The fluid maintenance rates typically advised for children are probably too generous for use in children with diabetic ketoacidosis. 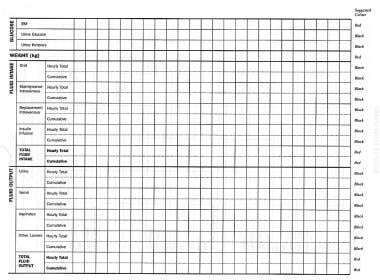 Table 2, below, can be used to calculate more appropriate infusion rates. Continuous, low-dose, intravenous (IV) insulin infusion is generally accepted as the safest and most effective method of insulin delivery for treating diabetic ketoacidosis. Low-dose IV insulin infusion is simple, provides more physiologic serum levels of insulin, allows gradual correction of hyperglycemia, and reduces the likelihood of sudden hypoglycemia and hypokalemia. The results of a prospective national study of diabetic ketoacidosis in the United Kingdom suggested a greater risk of cerebral edema in patients who received insulin within the first hour of treatment. In light of these results, starting insulin therapy an hour after fluid resuscitation has commenced is prudent, especially in the newly diagnosed child. The correct dose of insulin to infuse in the treatment of diabetic ketoacidosis is under debate. Traditionally, 0.1 U/kg/h is given, but a lower dose of 0.05 U/kg/h is enough to prevent gluconeogenesis and results in a slower reduction of blood glucose levels. One study showed no disadvantage to using the lower infusion rate of 0.05 U/kg/h. Adolescents with secondary diabetic ketoacidosis and insulin resistance may need more than 0.1 U/kg/h. Authorities commonly recommend that blood glucose levels not fall faster than 90 mg% (ie, 5 mmol/L) per hour. The infusion rate of insulin can be reduced as blood glucose levels fall but should not drop below 0.05 U/kg/h, to prevent any recurrence of ketosis. Do not discontinue infusion until subcutaneous insulin has been given when the child has recovered. If blood glucose falls below 120 mg% (ie, 7 mmol/L), increase the concentration of infused glucose to prevent hypoglycemia. Ketosis clears more quickly if insulin infusions are prolonged for 36 hours or more. Patients with diabetic ketoacidosis always have a total-body deficit of potassium. After initial resuscitation and if serum/plasma levels are below 5 mEq/L or a good renal output has been maintained, add potassium to all replacement fluids. Table 3, below, provides examples of infusion concentrations in milliequivalents per liter for differing degrees of potassium status. Potassium chloride most commonly is administered. This theoretically could make the acidosis worse, but no evidence indicates that administration of other potassium salts, such as phosphate or acetate, is more effective. Although metabolic acidosis may be severe, no evidence supports the administration of IV sodium bicarbonate to improve outcomes; on the contrary, the evidence indicates that IV bicarbonate may cause harm and delay recovery. [43, 44] Failure of the acidosis to improve with treatment more likely reflects inadequate fluid and insulin replacement. The only justification for using IV bicarbonate is acidosis sufficiently severe to compromise cardiac contractility. Although patients usually have an absolute deficit of phosphate and magnesium, no evidence indicates that either needs to be replaced in patients with diabetic ketoacidosis. If cerebral edema is suspected and hypoglycemia is excluded, prompt treatment with an osmotic diuretic is indicated, followed by a CT scan and referral to a neurosurgeon. Intubation, hyperventilation, and intracranial pressure monitoring reportedly improve outcomes. Although mannitol has been the most commonly used osmotic diuretic, theoretical and experimental reasons for using hypertonic saline (3%) have been noted. The usual dose of mannitol to treat cerebral edema is 0.5-1 g/kg infused over 30 minutes, which can be repeated after 1 hour. The usual dose of hypertonic saline is 5-10 mL/kg, again infused over 30 minutes, which can be repeated after 1 hour. Only half of children who develop cerebral edema have obvious signs of deterioration; children may present with respiratory arrest. Young children have a greater risk of respiratory arrest, and the outcome for these children is particularly bad. A United Kingdom study reported that every child who presented with respiratory arrest either died or was left with neurologic deficits. Attention to detail is important to achieving a good outcome. Carefully monitor potassium status to prevent complications from hypokalemia. Hypoglycemia should not occur with adequate monitoring and is less likely if low-dose, continuous insulin infusions are administered together with dextrose when blood glucose levels fall below 200 mg/dL (11 mmol/L). Specifically designed recording charts (see the images below) make the process of care much easier. 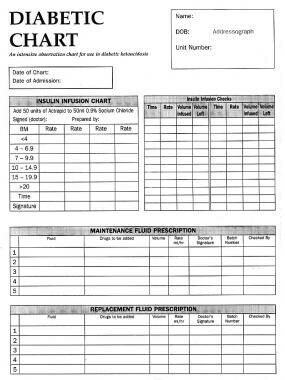 Ideally, these charts include all important measurements of clinical and biochemical status, fluid balance, and insulin prescription. 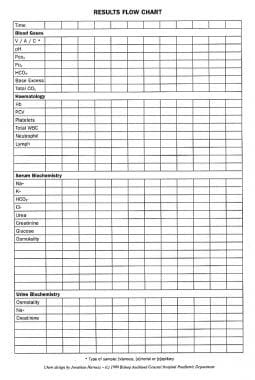 Diabetic ketoacidosis treatment and results chart (page 1 of 4). Diabetic ketoacidosis treatment and results chart (page 2 of 4). Diabetic ketoacidosis treatment and results chart (page 3 of 4). 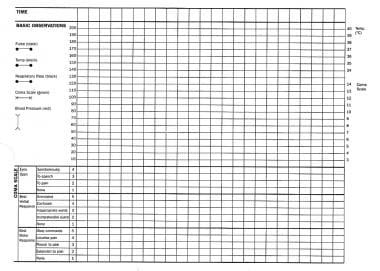 Diabetic ketoacidosis treatment and results chart (page 4 of 4). Frequent review of neurologic status—at least hourly (or any time a change in the level of consciousness is suspected)—is essential during the first 12 hours of diabetic ketoacidosis treatment. Promptly treat any suspected cerebral edema. Diabetic ketoacidosis in a patient in whom diabetes is newly diagnosed can be prevented only if the general public and primary care physicians know the symptoms and if physicians are alert, particularly with regard to young children, to the possibility of diabetic ketoacidosis developing. A urine test for glycosuria is easy to perform. Carbs for Kids-Count Them In: The Constant Carbohydrates Diet. Taking Diabetes Back to School. Edge JA, Roy Y, Bergomi A, et al. Conscious level in children with diabetic ketoacidosis is related to severity of acidosis and not to blood glucose concentration. Pediatr Diabetes. 2006 Feb. 7(1):11-5. [Medline]. Harris GD, Fiordalisi I. Physiologic management of diabetic ketoacidemia. A 5-year prospective pediatric experience in 231 episodes. Arch Pediatr Adolesc Med. 1994 Oct. 148(10):1046-52. [Medline]. Wolfsdorf J, Craig ME, Daneman D, et al. Diabetic ketoacidosis. Pediatr Diabetes. 2007 Feb. 8(1):28-43. [Medline]. Marshall SM, Walker M, Alberti KGMM. Diabetic Ketoacidosis and Hyperglycaemic non-ketotic coma. Alberti, Zimmet, Defronzo eds. International Textbook of Diabetes Mellitus. 1997. 1215-30. Fagan MJ, Avner J, Khine H. Initial fluid resuscitation for patients with diabetic ketoacidosis: how dry are they?. Clin Pediatr (Phila). 2008 Nov. 47(9):851-5. [Medline]. Durr JA, Hoffman WH, Sklar AH, et al. Correlates of brain edema in uncontrolled IDDM. Diabetes. 1992 May. 41(5):627-32. [Medline]. Hale PM, Rezvani I, Braunstein AW, et al. Factors predicting cerebral edema in young children with diabetic ketoacidosis and new onset type I diabetes. Acta Paediatr. 1997 Jun. 86(6):626-31. [Medline]. Mel JM, Werther GA. Incidence and outcome of diabetic cerebral oedema in childhood: are there predictors?. J Paediatr Child Health. 1995 Feb. 31(1):17-20. [Medline]. Silver SM, Clark EC, Schroeder BM, Sterns RH. Pathogenesis of cerebral edema after treatment of diabetic ketoacidosis [published erratum appears in Kidney Int 1997 May;51(5):1662]. Kidney Int. 1997 Apr. 51(4):1237-44. [Medline]. Okuda Y, Adrogue HJ, Field JB, et al. Counterproductive effects of sodium bicarbonate in diabetic ketoacidosis. J Clin Endocrinol Metab. 1996 Jan. 81(1):314-20. [Medline]. Glaser N. Cerebral injury and cerebral edema in children with diabetic ketoacidosis: could cerebral ischemia and reperfusion injury be involved?. Pediatr Diabetes. 2009 Dec. 10(8):534-41. [Medline]. Musey VC, Lee JK, Crawford R. Diabetes in urban African-Americans. I. Cessation of insulin therapy is the major precipitating cause of diabetic ketoacidosis. Diabetes Care. 1995 Apr. 18(4):483-9. [Medline]. Thompson CJ, Cummings F, Chalmers J, Newton RW. Abnormal insulin treatment behaviour: a major cause of ketoacidosis in the young adult. Diabet Med. 1995 May. 12(5):429-32. [Medline]. Morris AD, Boyle DI, McMahon AD, et al. Adherence to insulin treatment, glycaemic control, and ketoacidosis in insulin-dependent diabetes mellitus. The DARTS/MEMO Collaboration. Diabetes Audit and Research in Tayside Scotland. Medicines Monitoring Unit. Lancet. 1997 Nov 22. 350(9090):1505-10. [Medline]. Smaldone A, Honig J, Stone PW, et al. Characteristics of California children with single versus multiple diabetic ketoacidosis hospitalizations (1998-2000). Diabetes Care. 2005 Aug. 28(8):2082-4. [Medline]. [Full Text]. Holstein A, Abel C, Zumwalde I. Recurrent severe diabetic ketoacidosis due to intoxication with synthetic drugs ('Ecstasy' and 'Speed'). Intensivmedizin und Notfallmedizin. 1997. 34(1):46-50. Rewers A, Klingensmith G, Davis C, et al. Presence of diabetic ketoacidosis at diagnosis of diabetes mellitus in youth: the Search for Diabetes in Youth Study. Pediatrics. 2008 May. 121(5):e1258-66. [Medline]. Smith CP, Firth D, Bennett S, et al. Ketoacidosis occurring in newly diagnosed and established diabetic children. Acta Paediatr. 1998 May. 87(5):537-41. [Medline]. Rewers A, Chase HP, Mackenzie T, et al. Predictors of acute complications in children with type 1 diabetes. JAMA. 2002 May 15. 287(19):2511-8. [Medline]. Levy-Marchal C, Patterson CC, Green A. Geographical variation of presentation at diagnosis of type I diabetes in children: the EURODIAB study. European and Dibetes. Diabetologia. 2001 Oct. 44 Suppl 3:B75-80. [Medline]. Edge JA, Dunger DB. Variations in the management of diabetic ketoacidosis in children. Diabet Med. 1994 Dec. 11(10):984-6. [Medline]. Neu A, Hofer SE, Karges B, Oeverink R, Rosenbauer J, Holl RW. Ketoacidosis at diabetes onset is still frequent in children and adolescents: a multicenter analysis of 14,664 patients from 106 institutions. Diabetes Care. 2009 Sep. 32(9):1647-8. [Medline]. [Full Text]. Usher-Smith JA, Thompson MJ, Sharp SJ, Walter FM. Factors associated with the presence of diabetic ketoacidosis at diagnosis of diabetes in children and young adults: a systematic review. BMJ. 2011 Jul 7. 343:d4092. [Medline]. Fritsch M, Rosenbauer J, Schober E, Neu A, Placzek K, Holl RW. Predictors of diabetic ketoacidosis in children and adolescents with type 1 diabetes. Experience from a large multicentre database. Pediatr Diabetes. 2011 Jun. 12(4 Pt 1):307-12. [Medline]. Delamater AM, Shaw KH, Applegate EB, et al. Risk for metabolic control problems in minority youth with diabetes. Diabetes Care. 1999 May. 22(5):700-5. [Medline]. [Full Text]. Cohn BA, Cirillo PM, Wingard DL, et al. Gender differences in hospitalizations for IDDM among adolescents in California, 1991. Implications for prevention. Diabetes Care. 1997 Nov. 20(11):1677-82. [Medline]. Quinn M, Fleischman A, Rosner B, et al. Characteristics at diagnosis of type 1 diabetes in children younger than 6 years. J Pediatr. 2006 Mar. 148(3):366-71. [Medline]. Ghetti S, Lee JK, Sims CE, Demaster DM, Glaser NS. Diabetic ketoacidosis and memory dysfunction in children with type 1 diabetes. J Pediatr. 2010 Jan. 156(1):109-14. [Medline]. Edge JA, Ford-Adams ME, Dunger DB, et al. Causes of death in children with insulin dependent diabetes 1990-96. Arch Dis Child. 1999 Oct. 81(4):318-23. [Medline]. [Full Text]. Neu A, Willasch A, Ehehalt S, et al. Ketoacidosis at onset of type 1 diabetes mellitus in children--frequency and clinical presentation. Pediatr Diabetes. 2003 Jun. 4(2):77-81. [Medline]. Warner DP, McKinney PA, Law GR, Bodansky HJ. Mortality and diabetes from a population based register in Yorkshire 1978-93. Arch Dis Child. 1998 May. 78(5):435-8. [Medline]. [Full Text]. Hoffman WH, Locksmith JP, Burton EM, et al. Interstitial pulmonary edema in children and adolescents with diabetic ketoacidosis. J Diabetes Complications. 1998 Nov-Dec. 12(6):314-20. [Medline]. Holsclaw DS Jr, Torcato B. Acute pulmonary edema in juvenile diabetic ketoacidosis. Pediatr Pulmonol. 1997 Dec. 24(6):438-43. [Medline]. Muir AB, Quisling RG, Yang MC, Rosenbloom AL. Cerebral edema in childhood diabetic ketoacidosis: natural history, radiographic findings, and early identification. Diabetes Care. 2004 Jul. 27(7):1541-6. [Medline]. Sottosanti M, Morrison GC, Singh RN, Sharma AP, Fraser DD, Alawi K, et al. Dehydration in children with diabetic ketoacidosis: a prospective study. Arch Dis Child. 2012 Feb. 97(2):96-100. [Medline]. Brandenburg MA, Dire DJ. Comparison of arterial and venous blood gas values in the initial emergency department evaluation of patients with diabetic ketoacidosis. Ann Emerg Med. 1998 Apr. 31(4):459-65. [Medline]. Wiggam MI, O'Kane MJ, Harper R, et al. Treatment of diabetic ketoacidosis using normalization of blood 3- hydroxybutyrate concentration as the endpoint of emergency management. A randomized controlled study. Diabetes Care. 1997 Sep. 20(9):1347-52. [Medline]. Noyes KJ, Crofton P, Bath LE, et al. Hydroxybutyrate near-patient testing to evaluate a new end-point for intravenous insulin therapy in the treatment of diabetic ketoacidosis in children. Pediatr Diabetes. 2007 Jun. 8(3):150-6. [Medline]. Fiordalisi I, Novotny WE, Holbert D, Finberg L, Harris GD. An 18-yr prospective study of pediatric diabetic ketoacidosis: an approach to minimizing the risk of brain herniation during treatment. Pediatr Diabetes. 2007 Jun. 8(3):142-9. [Medline]. Puttha R, Cooke D, Subbarayan A, Odeka E, Ariyawansa I, Bone M. Low dose (0.05 units/kg/h) is comparable with standard dose (0.1 units/kg/h) intravenous insulin infusion for the initial treatment of diabetic ketoacidosis in children with type 1 diabetes-an observational study. Pediatr Diabetes. 2009 Jul 6. [Medline]. Butkiewicz EK, Leibson CL, O'Brien PC, Palumbo PJ, Rizza RA. Insulin therapy for diabetic ketoacidosis. Bolus insulin injection versus continuous insulin infusion. Diabetes Care. 1995 Aug. 18(8):1187-90. [Medline]. Della Manna T, Steinmetz L, Campos PR, Farhat SC, Schvartsman C, Kuperman H. Subcutaneous use of a fast-acting insulin analog: an alternative treatment for pediatric patients with diabetic ketoacidosis. Diabetes Care. 2005 Aug. 28(8):1856-61. [Medline]. Green SM, Rothrock SG, Ho JD, et al. Failure of adjunctive bicarbonate to improve outcome in severe pediatric diabetic ketoacidosis. Ann Emerg Med. 1998 Jan. 31(1):41-8. [Medline]. Hale PJ, Crase J, Nattrass M. Metabolic effects of bicarbonate in the treatment of diabetic ketoacidosis. Br Med J (Clin Res Ed). 1984 Oct 20. 289(6451):1035-8. [Medline]. White H, Cook D, Venkatesh B. The use of hypertonic saline for treating intracranial hypertension after traumatic brain injury. Anesth Analg. 2006 Jun. 102(6):1836-46. [Medline]. Vanelli M, Chiari G, Ghizzoni L, et al. Effectiveness of a prevention program for diabetic ketoacidosis in children. An 8-year study in schools and private practices. Diabetes Care. 1999 Jan. 22(1):7-9. [Medline]. [Full Text]. [Guideline] Miller SG. Family therapy for recurrent diabetic ketoacidosis: Treatment guidelines. Family Systems Medicine. 1996. 14(3):303-14. Douglas D. Isotonic Fluids Helpful in Diabetic Ketoacidosis in Kids: Study. Medscape. Apr 4 2013. Available at http://www.medscape.com/viewarticle/781938. Accessed: April 16, 2013. White PC, Dickson BA. Low Morbidity and Mortality in Children with Diabetic Ketoacidosis Treated with Isotonic Fluids. J Pediatr. 2013 Mar 15. [Medline]. Glasgow Coma Scale, modified for age of verbal response. A graphical representation of the electrocardiographic changes of hypokalemia. A graphical representation of the electrocardiographic changes of hyperkalemia (due to overcorrection of potassium loss). The author would like to thank Debbie Matthews and Tim Cheetham for reading the manuscript and for all of their support.